IDF in News- Dainink Jagran. In a bit to spread awareness on the World TB Day, Goregaon-based Indian Development Foundation (IDF) designed and circulated a special poster featuring Olympian and hockey legend Dhanraj Pillay. The posters have been distributed to various educational institutions, public offices, corporate and social organisations in the city. The World TB Day was on Sunday, March 24. "We have printed a multilingual poster so that the message reaches more people," said Narayan Iyer, CEO, IDF. Pillay visited the IDF office located at Goregaon on Thursday. "The awareness messages will certainly help to save several precious lives in the process. I am happy to be a part of the national programme," said Pillay. Hockey Legend Dhanraj Pillay and Brand Ambassador of IDF's TB Awareness programme for World TB Day 2013 visited Indian Development Foundation office at Goregaon, Mumbai on 28th March 2013. Dr. ARK Pillai, founder President and all the members of the Foundation recorded sincere appreciation and gratitude for the excellent support extended by the Hockey Legend for the cause of TB. World TB Day Rally at Trichy. World TB Day 2013 Awareness Rally organized by Indian Development Foundation (IDF) and Sahayamatha Hospital was a grand success. Good number of students, volunteers, supporters and social ambassadors thronged to Light House in pullambadi, Trichy. Mr. Jacob Arul Raj, Panchayat Leader flaged off the participants walked carrying placards and posters on TB. Indian Overseas Bank supported the event. Lions club of Kallanai also participated and graced the event. The event was co-ordinated in a much successful and meaningful manner. OUR GOAL - A-TB FREE WORLD. They made unlikely messengers, but these children, dressed smartly in crisp Scouts and Guides uniforms, made their mark at the Chennai Central Railway Station on Sunday morning, taking the message of TB awareness to the masses. The Indian development Foundation (IDF), along with specialists from Gremaltes Hospital organised an awareness exhibiition on World Tuberculosis day, to educate passengers passing through Central station about the symptoms and treatment of the dreaded bacterial infection. “If you have chest pain and perpetual cough for 2 weeks or more, along with loss of appetite and weight, you should go get tested. You may also see blood in sputum and fever in the evenings,” a young volunteer-guide from Kendriya Vidyalaya-2, Tambaram was overheard explaining to a family waiting at the station. “You can treat people with TB normally; you can hug them, talk to them and give them moral support. TB is completely curable if diagnosed in time, but it is important that you complete the entire 7 month course of antibiotics,” explained the student, highlighting the threat of multi drug resistant TB, caused mainly due to discontinuation of antibiotic course. While 10,000 people received an awareness pamphlet, at least 20 per cent of them dropped in to read the charts on display in the main waiting hall of the station. “The treatment of TB is completely free of cost, medicines are provided by the Chennai corporation,” said Pius Kalathil, direcctor of Gremaltes hospital, which works with TB patients. 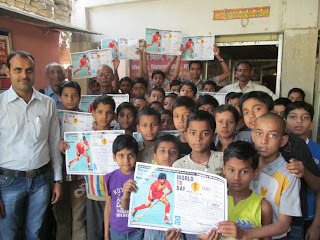 Hockey Legend Dhanraj Pillay and Brand Ambassador of IDF supports TB Cause. Dr. ARK Pillai, founder President and all the members of the Foundation recorded sincere appreciation and gratitude for the excellent support extended by the Hockey Legend for the cause of TB. Shri Dhanraj Pillay appreciated the humanitarian work of IDF and exhorted more young minds to join hands for a noble cause. Message of support and public participation !!! “Prevention is better than cure”. As the proverb says, it is always better to take prevention instead of curing. Tuberculosis is a bacterial disease usually affecting the lungs (pulmonary TB). It also affects other body parts, like; lymph nodes, kidneys, bones, joints etc. Tuberculosis cases (extra pulmonary TB) are reported every year with New York leading the list,approximately 1300 yearly cases. Tuberculosis can affect anyone of any age. Usually, people with weakened immune systems are at increased risk. Tuberculosis is spread through the air when a person with untreated pulmonary TB coughs or sneezes. However, there are many treatments for tuberculosis. People with latent TB infection should be evaluated for a course of preventive therapy, which usually includes taking anti tuberculosis medication for several months. People with active TB disease must complete a course of treatment for six months or more. Initial treatment includes at least 4 anti TB drugs; and medications may be altered based on laboratory test results. Directly Observed Therapy (DOT) programs are recommended for all TB patients to help them complete their therapy. An untreated TB patient may become severely ill or die. The most important way to stop the spread of tuberculosis is that TB patients’ mouth and nose should be covered while coughing/sneezing, and to take all the TB medicine exactly as prescribed by the physician. Instead of reacting against tuberculosis after it attacks us, it is better to take preventive measures in reducing the number of cases of tuberculosis. Tuberculosis prevention and control efforts primarily rely on the vaccination of infants and the detection and appropriate treatment of active cases. The WHO has achieved some success with improved treatment regimen. The only currently available vaccine as of 2013 or before is Bacilli ChalmetteGuerin (BCG). BCG is effective against disseminated disease in childhood and confers inconsistent protection against contracting pulmonary TB. A number of new vaccines are currently in development. The WHO declared TB “A global health emergency”. In 1993 and in 2006, the Stop TB Partnership developed a global plan to stop Tuberculosis that aims to save 14 million lives between its launch and 2015. A number of targets they have set are not likely to be achieved by 2015, mostly due to the increase in HIV – associated tuberculosis and the emergence of multiple drug resistant tuberculosis. A tuberculosis classification system developed by the American Thoracic Society is used in primary health programs. The recommended treatment of new onset of pulmonary tuberculosis, as of 2010, is six months of a combination of antibiotics for the first two months. If tuberculosis recurs,testing to determine to which antibiotics it is sensitive is important before determining treatment. Primary resistance occurs when a person become infected with a resistant strain of TB. A person with fully susceptible TB may develop secondary (acquired) resistance during therapy because of inadequate treatment, not taking the prescribed regimen appropriately (lack of compliance) or using low quality medication. Drug resistant TB is a serious public health issue in many developing countries, as its treatment is longer and expensive. Extensively Drug - Resistant TB is resistant to three or more of the six classes of second line drugs. Totally Drug - Resistant TB, which was first observed in 2003 in Italy, but not widely reported until 2012, is resistant to all currently used drugs. So, as citizens, let’s join hands and pledge to reduce the cases of tuberculosis and remove it completely from the world and prevent it from spreading. Let’s spread this message to each and everyone to succeed in our mission. Without the people’s support and cooperation, this seems to be impossible. So, I request each one of you to contribute for this, in some way or the other, and help in making a TB free world. Sir. M. Madana Gopal, I.A.S, Principal Secretary, Department of Health and Family, Govt. of Karnataka was the Chief Guest for the function. In his address, he mentioned that Drug Resistalation that are the most vulnerable population. Earlier, Sri Madana Gopal cut the ribbon and inaugurated the varnt TB was a major challenge and it should be faced in an effective manner. Emphasising the importance of DOTS, he called for the participation and support of all the Practitioners. He also said that special attention was required on TB-HIV popuious TB awareness stalls that had been installed to generate awareness. Indian Development Foundation also initiated an awareness campaign through auto rickshaws in various places of the city; and around 300 auto rickshaws participated in the campaign. Young Social Ambassador, Master Karan Dravid gave an inspiring speech on TB, soliciting the support of all in the crusade against TB. 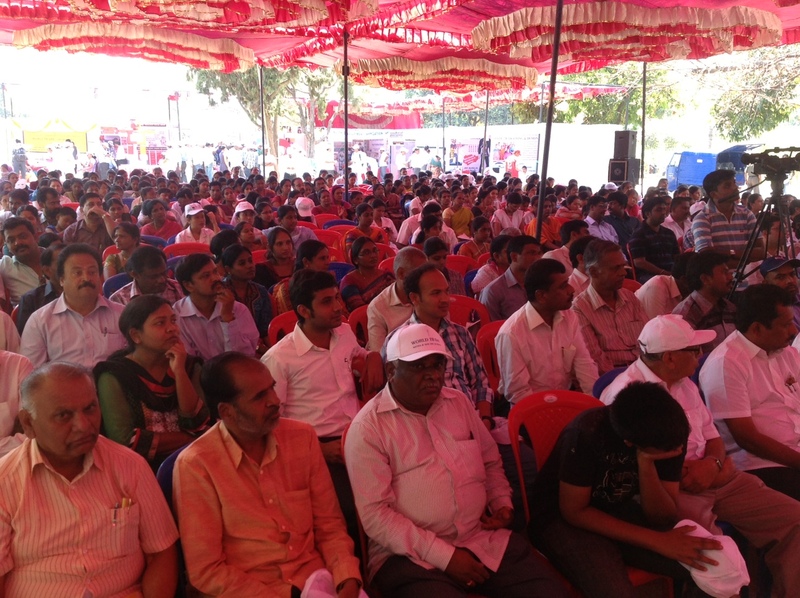 A few cultural programs were also organised to entertain and educate the large gathering on TB. IDF had organised a Hombe Atta, by a leading artist, Ms. Jeyashree, who won the attention and appreciation of all. A few awareness posters and stickers were released on the occasion. The function was attended bymany Officer Viz; Sri. R.R. Jannu, I.A.S, Rural Health Mission, Dr. B. Dhanyakumar, Director, Department of Health and Family Welfare, Dr. Shasidhar Buggi, Director, SDS and RGICD, Sri. 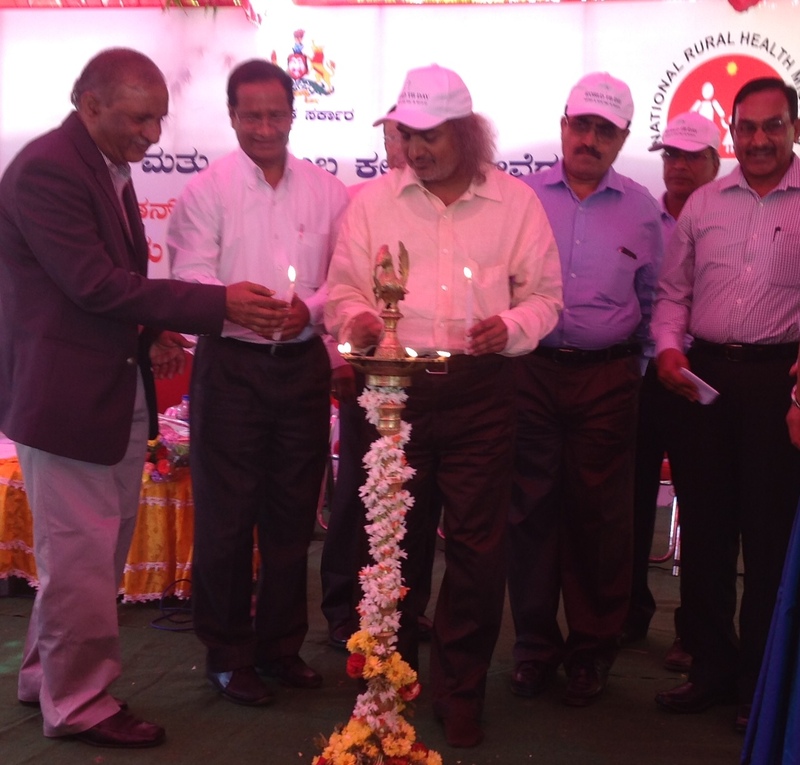 B.V. Patil, IAS, Commissioner, Department of Health and Family Welfare and Dr. Prahalad Kumar, Director, National Tuberculosis Institute. Mr. AG Prakash, Principal of Sri Ayyappan Educational Institutions, Jayamhal Extension, IDF Ambassadors, Ms, Kalpana Devi, Master Nishchith, Miss Neha, Ms. Padma Sunderrajan and her family and Ms. Vidya Jeyaraj took active part in the event. 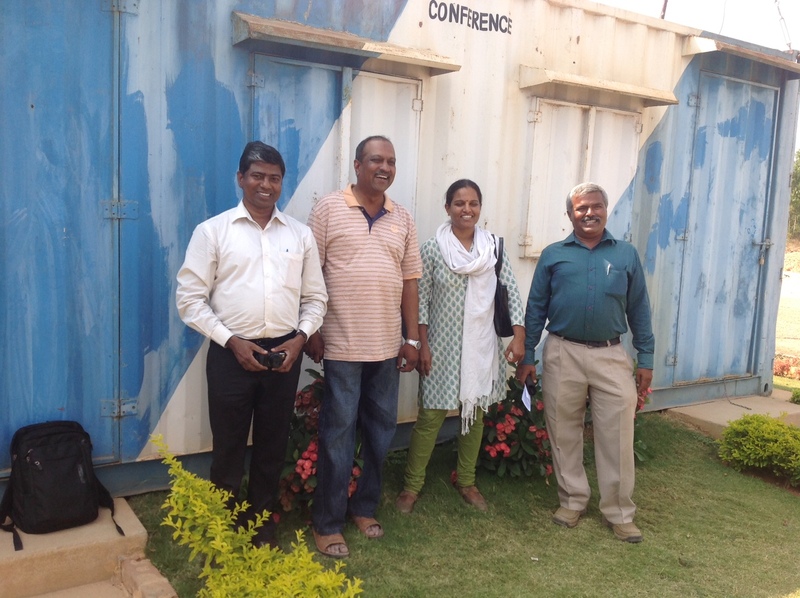 IDF staff, Mr. Ramakrishnan, Mr. Gurumurthy, Mr. Umesh Prasanna, Mr. Arulraj, Ms. Geetha and Mr. Ashok. did their very best towards making mark of IDF. Dr. M.D. Suryakanth, Joint Director (TB) and State TB Officer, welcomed and Dr. Anil Kumar, Deputy Director, Government of Karnataka, proposed vote of thanks. Creating awareness through sticking posters on Tuberculosis by students and cleaning the surroundings in the prime locality of the city marked the World TB Day observance in Mangalore on Sunday. 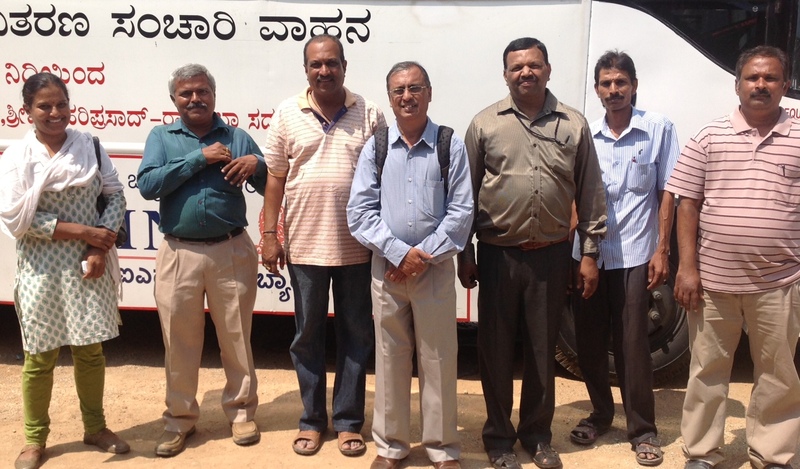 The drive was carried out by Centre for Integrated Learning (CIL) in association with the Amala Bharat Campaign (ABC) of Mata Amruthanandamayi Mutt and Rotary Club of Mangalore and participated by students of Karnataka Ayurveda College and Srinivas Institute of Social Work. The Deputy Speaker of Karnataka Legislative Assembly N Yogish Bhat distributed the awareness brochures to launch the awareness drive and the locality cleaning programme at PVS Junction area. 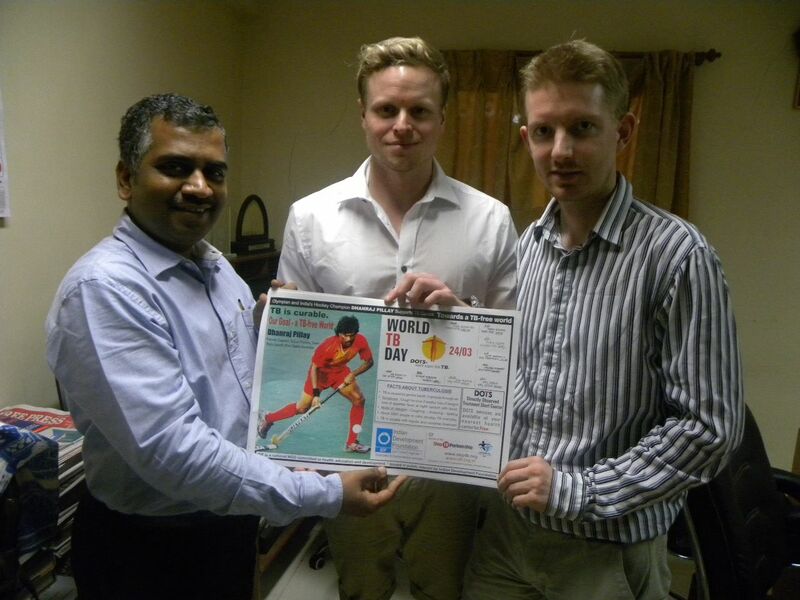 The specially designed TB Awareness poster which is endorsed by Indian Hockey legend Dhanraj Pillai is published by India Development Foundation (IDF). The posters were stuck at strategic locations so as to draw the attention of the passerby. Speaking on the occasion, Mr. Bhat stressed the need for educate and create awareness among general public on diseases like TB which is purely caused due to lack of public hygiene. He appreciated the students for taken the responsibility of carrying forward the mission to eradicate such communicable diseases. He also mentioned that the City Corporation has been striving to work out effective measures to enable the solid waste management in the city. Amruthanandamayi Mutt Pontiff Mangalananda Swamini, Swamini Sandhaya from Amaruthapuri in Kerala, Convener of ABC Dr. Jeevaraj Sorake, President of Rotary Club of Mangalore Madhav Suvarna, Executive Director of Centre for Integrated Learning Sachitha Nandagopal among others were present on the occasion. 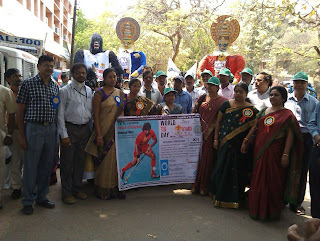 On 24th March 2013 IDF AP took part in the World TB Day event in Director of Medical Education, Sultan Bazar, Hyderabad. Mr.Ajay Sawhney, IAS, Prinicpal Secretary Health and Family Welfare, Govt of AP was the Chief guest and Dr. Aruna Kumari, Director of Public Health & FW, Dr. T. Rani Samyukta Jt. Director (TB) & State TB Officer AP, Hyderabad graced the occasion. 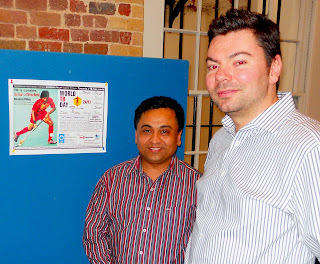 Flexes and Posters featuring Dhanraj Pillai, Gagan Narang, Mary Kom, Anil Kumble were displayed in all PHCs, UHCC, leading hospitals, teaching instituitions, government departments, corporate offices. A rally was organized where in the volunteers from hospitals, Nursing colleges. I- Mr.Abhijit Tej, Class IX 'C', Prathibha Vidya Niketan High School, Hyd. II- Ms.Asiya Fatima , Class VIII A , IICT ZM High School, Habsiguda, Hyd. III- Ms.G.Samnaa, Class IX , Kendriya Vidyalaya No.1, Uppal , Hyd. We met the Principal Secretary Mr.Ajay Sawhney and handed over a copy of the annual report and joint action and briefed him about IDF and our activities. Government officials ,Schools, TB dept, medical officers, children and parents appreciated IDF and our activities. FOR MORE PHOTO CLICK LINK. Indian Development Foundation (IDF), along with specialists from Gremaltes Hospital organised an awareness exhibition on World TB Day, to educate passengers passing through Central station at Chennai. “You can treat people with TB normally; you can hug them, talk to them and give them moral support. TB is completely curable if diagnosed in time, but it is important that you complete the entire course of antibiotics,” explained the student, highlighting the threat of multi-drug resistant TB, caused mainly due to discontinuation of antibiotic course. While 10,000 people received an awareness pamphlet, at least 20 per cent of them dropped in to read the charts on display in the main waiting hall of the station. 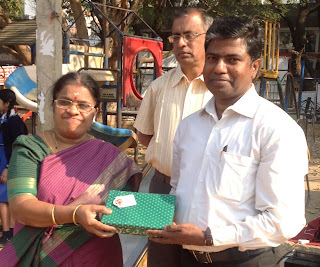 Mrs. R. Rajammal, Asst. Leader Trainer (Guides), Mrs. Padma Balakumar, Guide captain from K.V. No.2, Mr. Sreeram and Mr. Sathyamurthy from IDF co-ordinated the entire even in collaboration with IDF team, social ambassadors, students from Kendriya Vidyalaya No.2, Tambaram and team from Gremaltes Hospital. 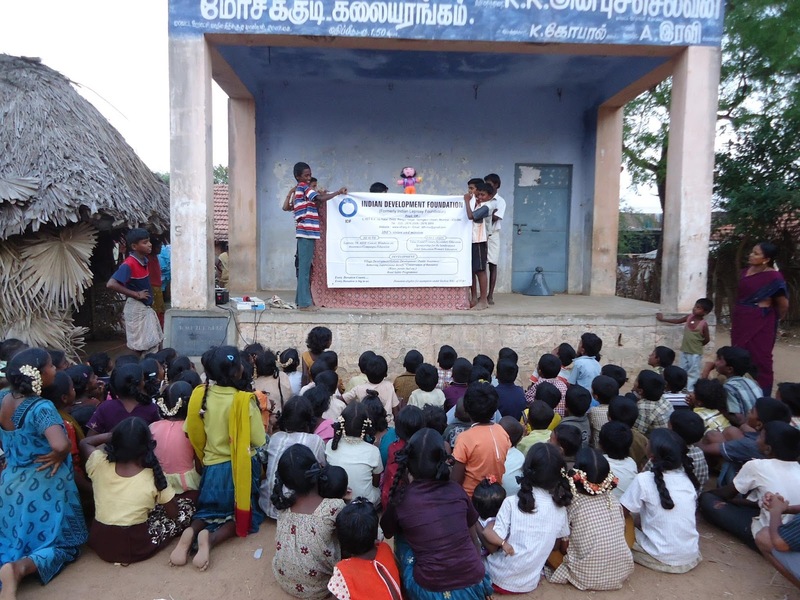 IDF team organizing TB Awareness programme at Mosakudi village, Keeranur, Pudukottai District, Tamil Nadu. 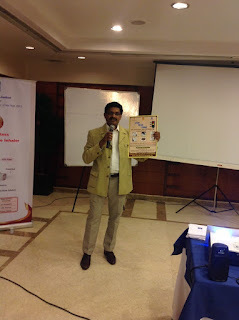 Mr. Solomon Raja Spoke on the symptoms and preventive measures to taken for the prevention of Disease. He also adviced people for taking the medicines regularly and not breaking the course of medication. 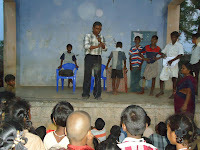 Thanks to Mr.Solomon Raja from IDF for organizing such a meaningful event for the benefit of the villagers. IDF is committed to stop TB !!! 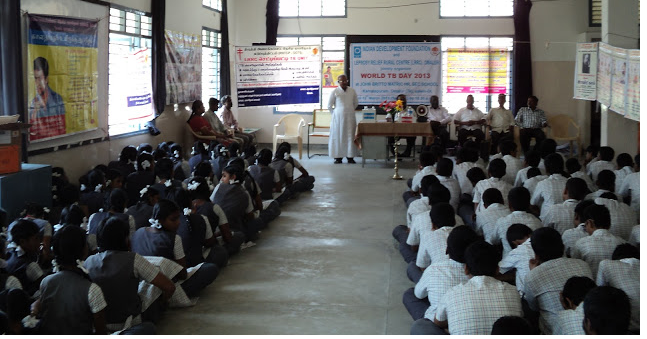 WORLD TB DAY Programme PSG Medical College, Coimbatore. On the WORLD TB DAY a grand function was held 23.03.2013 at the PSG Medical College hospital, Coimbatore, jointly organized by Indian Development Foundation (IDF) and RNTCP (Deputy Director of Medical Services (TB) Coimbatore. Dr. Elango, Joint Director, Health Services flagged off the rally from PSG Hoptital. Medical and Nursing students from PSG Hospital and various School students from Coimbatore District participated in the rally. Dr. Anupama Murthy gave a detailed lecture on TB and Dr. Karthikeyan also spoke about the treatment. Dr. Appanna Raja also participated in the function. The Co-ordinator from PSG welcomed the gathering. Dr. Sakthivel, Deputy Ditrector of Medical Services (TB) spoke on TB and its scenario. 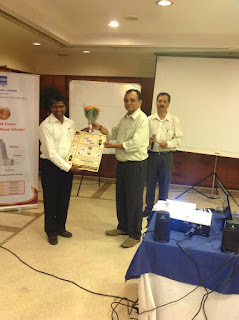 Dr. Subramani Raja WHO consultant gave a lecture on RNTCP and DOTS. 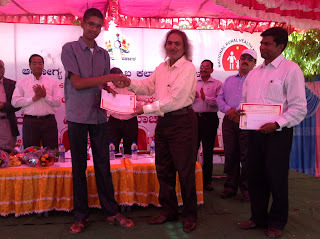 During the function cash prize, certificate and mementos were given to the best three students who participated in the essay contest LET'S STOP TB. Consolation prizes were given to students who participated in the essay contest. Refreshments were given to the students who participated in the rally and also lunch was provided in the afternoon for all the participants. STOP TB IN MY LIFE TIME. IDF TB Awareness Drive at various Places. Mr. Thomas, IDF Social Ambassador distributed TB Awareness Posters in various schools in Patna, Bihar. Asian Age Public School, St. Dominic Scholl, St. Karens School, G.S. Tutorial, Patna Montesary School, Competitive Edge Institute, British Lingua Institute , Brilliant Institute, Solution Classes, Ramkrishna Mission School, Patna. Our special thanks to Mr.Thomas and Mr. Anil Kumar from KNS, Patna. IDF TB Awareness Poster at the Royal College of Pathologist, London. Dr. Sanjib Bhakta, (Head of Mycobacteria Research Laboratory, Institute of Structural and Molecular Biology, Birkbeck, University of London & UCL Research Department of Infection) chaired the session "Mycobacterium tuberculosis..... Can we beat it?" 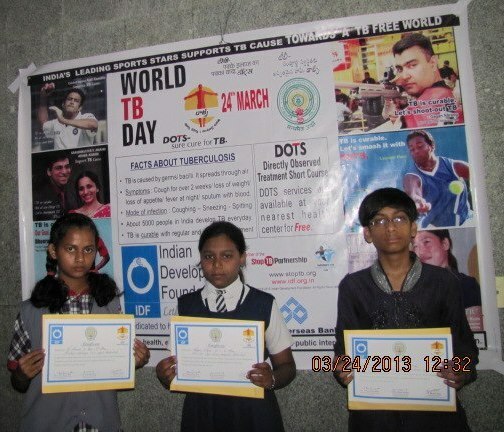 at the Royal College of Pathologist on 21st March 2013 as part of World TB Day 2013. Dr. Sanjib Bhakta supporter of IDF had put up TB Awareness Poster at the event and it was well received by the participants. IDF conveys special thanks to Dr. Sanjib Bhakta for all the support. IDF is committed to stop TB. World TB Day 2013 Awareness Rally organized by Indian Development Foundation (IDF) and Gremaltes Hospital was a grand success. Good number of volunteers, supporters and social ambassadors thronged to Light House in Marina Beach, Chennai and after the flag off by Mr.Mariappan, Director (News), Doordarshan, the participants walked till Labour Statue carrying placards and posters on TB. Indian Overseas Bank supported the event. Social champions from Standard Chartered also took active part in the public rally. IDF team led by Mr.Sreeram co-ordinated the event in a much successful and meaningful manner. Nishchith in Bangalore is the young social ambassador of IDF. Nishchith (class X student from Kendriya Vidyalaya, MEG & Centre, Bangalore) has been associated with IDF from his young age. He has been spreading the message of goodness all around. Participating in various social projects of IDF and providing music at all events are his passion. He has been teaching IDF Bal Gurukul children and feels proud to be part of IDF. Nishchith is a great inspiration to many young minds. IDF salutes the young social ambassadors who are the change-makers. IDF young social ambassador Karan Dravid (class VIII student of Kendriya Vidyalaya, MEG & Centre, Bangalore) speaks on goodness unlimited. Karan Dravid has been supporting IDF's social programmes from the age of eight. Karan Dravid got the title of the first youngest social ambassador of IDF and has been a great inspiration for many young minds. IDF is proud of its social ambassadors who are the change-makers. Mr. T. S. Ranganathan, Director, Giri Trading Agency speaking as the Guest of Honour at IDF's Annual Grants/ Awards Function held at Bharatiya Vidya Bhavan, Mylapore, Chennai on 8th August 2012. Giri Trading has been a great supporter of IDF for several years. 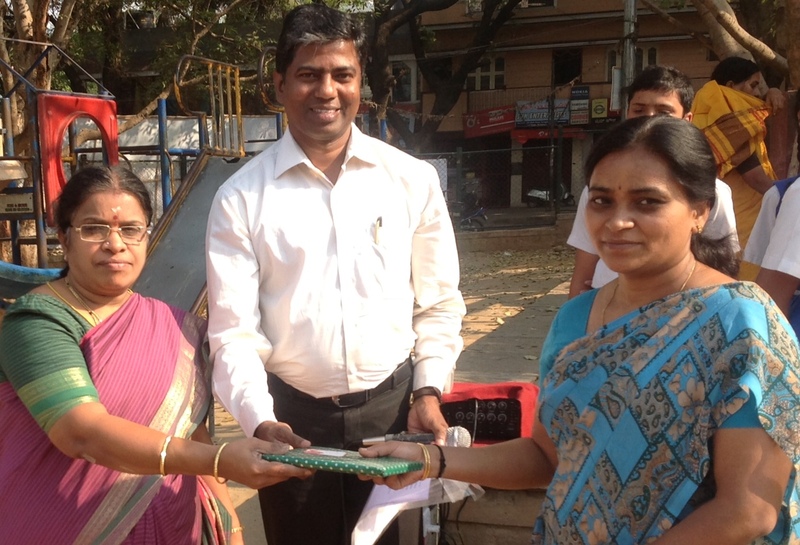 Mrs. Sharada Prakash, Director, GTA and all the members have been regularly supporting IDF by providing books for IDF Bal Gurukuls, dhoties and bedsheets for leprosy-affected persons. We thank Giri Trading for placing IDF Donation Boxes in all their outlets. Giri Trading is one stop shop for goodness unlimited. 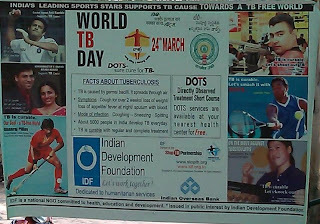 Indian Development Foundation (IDF) in collaboration with Gremaltes Hospital organised a massive TB Awareness Rally at Marina Beach, Chennai on the eve of World TB Day. Mr. E Mariappan, IIS, Director (News) Doordarshan Chennai, flagged off the rally from the Light House. A good number of volunteers and students took part in the rally to spread awareness. Mr. S Sreeram and Mr.K Satyamurthy from IDF, Mr. Pius Kalathil from Gremaltes Hospital, IDF Social Ambassadors Mr. Anil Kumar, Mrs. Kamakshi Siva, Mrs. R. Rajammal, Mrs. Padma and Ms. Shiloh Jessie Francisca spoke at the event and stressed on greater awareness and public participation. Scouts and guides from Kendriya Vidyalaya 2, Madambakkam and students from CSI School of Nursing also participated in the rally. Doctors, paramedical workers, volunteers from STRIPES NGO and morning walkers took active part in the rally, which concluded at the Labour Statue. 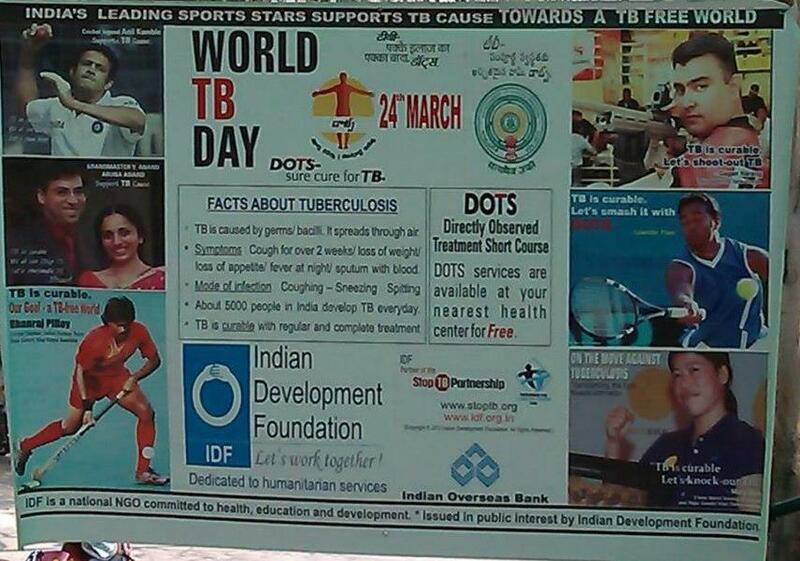 IDF creates TB awareness among Workers, Devanhalli Banglore. 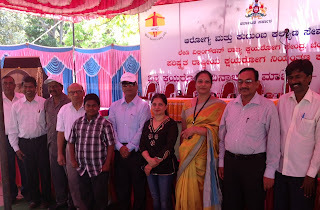 Indian Development Foundation organizes TB awareness program in collaboration with Karnataka State TB Association and Good Neighbours India at Vijay Nirman Unit - I, Hiranandani Construction Site, Devanahalli Road, Bangalore. Ms. Meena Arun, Project Manager, Good Neighbours India had taken the initiative. 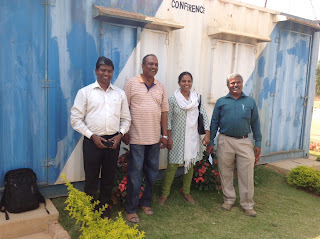 Mr. Ramakrishnan and Dr. Franklin from IDF along with Mr. Shenoy from KSTBA, conducted the film show. Around 100 construction workers benefitted from the audio visual program. Mr. K. Prasanna, Assistant General Manager (Projects), Vijay Nirman Company Pvt Ltd, expressed his appreciations and thanks for giving crucial messages on Tuberculosis and HIV/AIDS to the construction workers. IDF has been organising TB awareness campaigns for construction workers at Bangalore in various work sites for the benefit of the constructions workers in collaboration with Good Neighbours India. IDF Partners with D J Sanghvi College in the Marathon of Goodness. Clean-up Drive and Social Awareness !!! Engineering students of K.J. Somaiya Institute of Engineering and Information Technology, Sion, Mumbai in collaboration with Indian Development Foundation (IDF) organized a Juhu Beach Clean-up Drive on 17th of March 2013 from 6 am onwards. 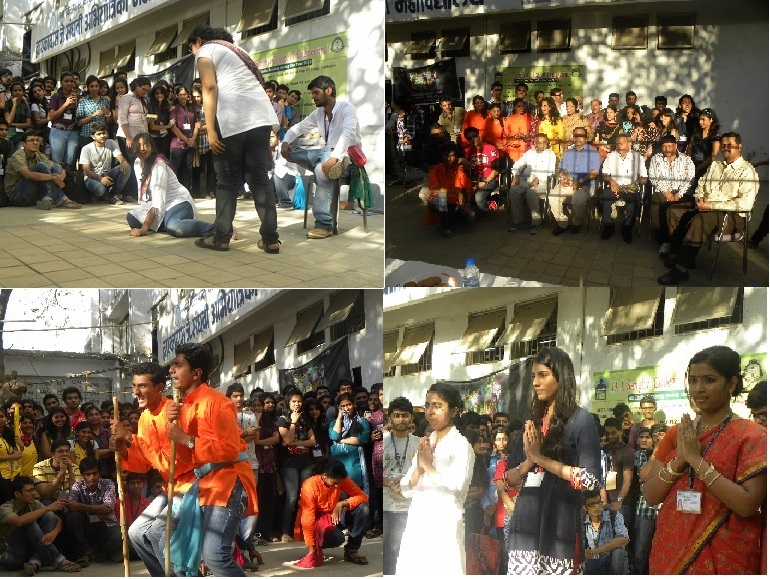 Social Engineers in Action - Street Play on "Respect for Women"
The students of Dwarkadas J. Sanghvi College of Engineering took a step towards social development by increasing the awareness about a wide range of social issues. 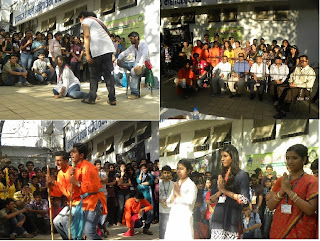 This was done in the form of Street Play organized on 14th March as a pre-fest event of PARICHAY 2013. Parichay is the annual social and cultural festival that is being celebrated on 21st, 22nd and 23rd March this year. The Inter Department Street Play saw various departments narrating stories that threw light on raging issues of the country. Dowry System, Female Foeticide, Eve Teasing, Female Slavery, Educate Women were chosen as the theme topics by the departments to spread the message and ensure respect to women. These plays highlighted in an effective manner the urgent need to protect the dignity and integrity of women in India. Also the theme based on Item Numbers refused to accept the derogatory terms and ways used to project women. It was a voice against disrespect shown to women. They also brought the importance of joint families so as to retain the traditional Indian culture and family values. The street play witnessed an enthusiastic response from the audience. The event was judged by the esteemed and distinguished jury members consisting of Dr ARK Pillai- President of Indian Development Foundation, Mr. Alok Nath Dixit- Director for TV and films with 20 years of direction experience, Mr Akkshit Saluja- Winner of Zara Nachke Dikha and part of movies like Tum Mile, Dhoka, many other adertisements, Mr Srikant- Assistant Director of Ready, No Entry, Singh is King. The other dignitaries present to judge the event included Mr. Hemant Kelkar, Ms. Rekha Bajaj, Mr Aunali Rupani, Brijesh Ji, Gautam Khanna, Mr. Narayan Iyer- CEO of Indian Development Foundation and Mrs. Sreelekha Iyer. The event succeeded in its attempt to increase social awareness with the help of all the judges and the enthusiasm shown by the college student. This event clearly depicted the increasing concern of the youth towards the society. Research on IDF work by CBS students. Students from Copenhagen Business School visited IDF as part of their research work on social business models in India. Asbjorn Jorgensen and Mads Hagelskjaer met Dr. Narayan Iyer at IDF office in Mumbai on 13-03-13 and discussed on IDF's social projects in India. The duo discussed on Public Private Partnerships with regard to sustainable development models and poverty alleviation programmes. Dr. Narayan Iyer presented World TB Day awareness poster to the students. The students and teachers of Holy Angels High School, Bangalore were appreciated with Social Support Awards for excellent participation and support to Indian Development Foundation (IDF) health, education and development projects. Dr. S. Franklin and Mr. R. Ramakrishnan from IDF expressed sincere thanks to Mr. Lokesh, Principal of the School, all the teachers and students for their kind and continuous support to various humanitarian projects. Indian Development Foundation (IDF) in association with Leprosy Relief Rural Center (LRRC) organizes World TB Day at John Britto Hr. Sec. School, Salem. Students were very attentive throughout the entire session. Students were made aware on symptoms, preventive measures, effects and general information on TB & health awareness. Persistent Cough for more than two weeks. Family Physicians Association, Bangalore is geared up to take part in the RNTP in a big way. During the fortnightly CME meeting organised at Hotel Solitaire, the Office Bearers and the members keenly participated in the lectures given by Dr. Subramaniam, a Family Physician, with excellent track record of service in RNTCP and Dr. S. Franklin, Manager of IDF this afternoon. Dr. Subramaniam, introduced Dr. Franklin and applauded the awareness generation programs of Indian Development Foundation (IDF). He appealed to the participating Family Physicians to extend their support for the national program. He emphasised that a simple gesture of displaying the TB awareness poster in their clinics will go a long way in prompting the patients towards taking the right initiatives at the right time. Dr. Mahesh Kumar, The Secretary of the FPA and Dr. Harish Kumar, The Treasurer, released the Indian Development Foundation TB awareness posters meant for the clinics of the Family Physicians. Mr. Ramakrishnan, Zonal Officer, Indian Development Foundation had made arrangements for the preparation of the posters, both in English and in Kannada. 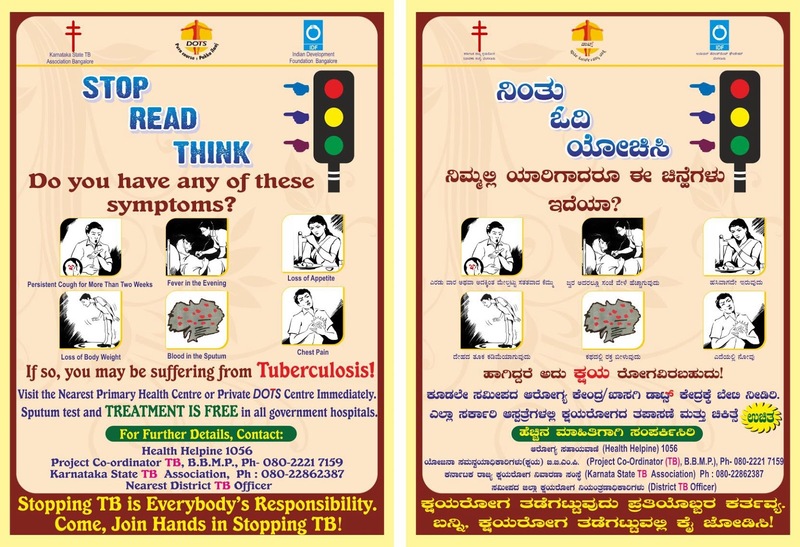 TB Awareness Poster designed for World TB Day 2013, Banglore. The poster will be put up in all the clinics in Bangalore. 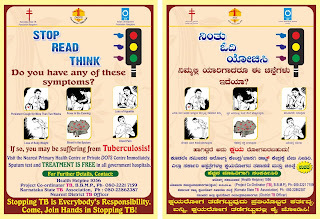 The campaign is supported by State TB Office, Karnataka, BBMP, Family Physician Association and IDF. Stopping TB is Everybody's Responsibility.